At first glance the scene doesn’t appear like anything out of the ordinary: a couple buddies chattering back and forth on a YouTube video as they fish a wacky rig on one of Western Michigan’s plentiful lakes. The sun reflects lazily off the water’s surface, as the guys reel in one largemouth after another. “Not us,” says the other. Only on closer inspection is anything out of the ordinary. The guys — Dan Badur and his buddy, Jim Meckley — are working as a team. Jim casts, flips the bale and places the fishing pole in a rod-holding bracket attached to Dan’s wheelchair. Immediately Dan hooks a fish and begins to reel it in. In addition to a lifelong fisherman, Dan Badur has been a quadriplegic for almost 40 years. A few years ago, after having tinkered with various off-the-shelf solutions to help him fish, he and a friend created the prototype for the FreedomFISHR. The device is essentially a motorized upgrade to a Shimano Syncopate spinning reel. He now sells the FreedomFISHR via his nonprofit, Fishing Abilities, Inc.. The nonprofit’s goal is to match disabled anglers with the right adaptive fishing solution for their needs. For anglers with the use of one hand, the FreedomFISHR will is the ticket. The solution replaces the manual crank with a 12 volt motor powered by an external Lithium-Ion Polymer battery. Connected to its battery via a power cable, the FreedomFISHR adds only a couple of ounces weight to the rod and reel, more than manageable one-handed. 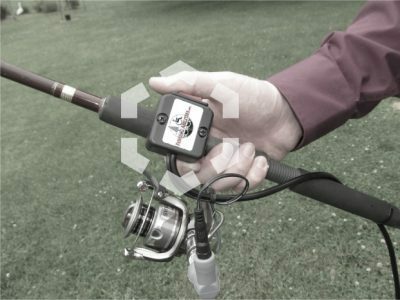 The FreedomFISHR’s variable speed control allows two speed settings, something that’s a key differentiator from some other solutions out there. Building on the FreedomFISHR, if an angler doesn’t have the use of their arms at all, Fishing Abilities offers the BadurMATE fishing system. The BadurMATE setup adds an easy-to-push slide button they can activate with a slight head or chin movement. The angler needs to purchase one of the many rod holders on the market or make one out of PVC tubing. Another option for anglers without enough finger control/strength to operate the FreedomFISHR’s rocker switch, but still has our movement is a joystick-based switch. The joystick is two speed, similar to the rocker switch. Like with the BadurMATE, the angler would need to make or purchase need a rod holder. The nonprofit’s adaptive solutions are not a cure-all, however. Powerwise, the FreedomFISHR’s motor tops out fighting a fish a couple of pounds in weight, at which point the angler would need to pump the rod to supplement the motor’s reeling, something not possible for paraplegics but if the drag is set correctly and you let the fish fight the rod they can still bring in about any size fish. The BadurMATE and Joystick still require an assist to bait the hook, cast out, and bring a catch into the boat or on shore. But participating in any way beats the passive alternative Dan experienced after breaking his neck. Dan’s next plans for FishingAbilities include further development of the “Whammer Slammer” prototype, an option that adds motion to the BadurMATE’s rod holder. That motion will enable the angler to twitch the bait and also set the hook when the he gets a bite. In addition to that R&D, Dan and his team are also constantly tweaking their solutions to help folks with different needs. One development that he’s been working on recently is a way to make the FreedomFISHR variable speed instead of two speed. Two speed is nice, but complete variable speed from zero to full speed at the touch of a finger would make it what any able-bodied fisherman can do. It’s all in service to his mission — helping folks get out and enjoy fishing again or for their first time. Dan Badur’s Fishing Abilities, Inc. is visible on GuideStar and accepts donations via FlipCause.